The nation’s news. Now on your iPad. Updated 24/7. 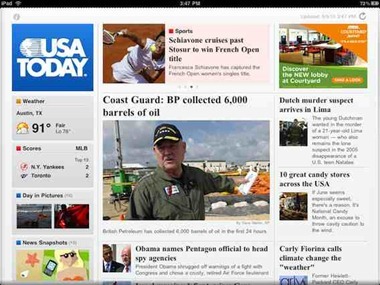 The latest news stories, scores, weather and photos you’ve come to expect from USA TODAY are now available in a beautiful new way, on your iPad. Staying informed has never been this quick, easy, or enjoyable. – Browse and read stories from USA TODAY’s signature News, Sports, Money and Life sections. Share stories with friends via email, Twitter, or Facebook. Download all stories to read offline; ideal when traveling. – Get live weather conditions, up-to-the minute personal radar and the five day forecast at your current location, or for a set of your favorite locations. 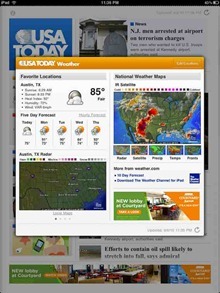 Review national weather maps including Doppler radar, temperature and precipitation forecasts. – Review the latest sports scores for NFL, MLB, NBA, NHL, college football and basketball. Stay up-to-date on the USA TODAY-ESPN Top 25 Polls for college sports. 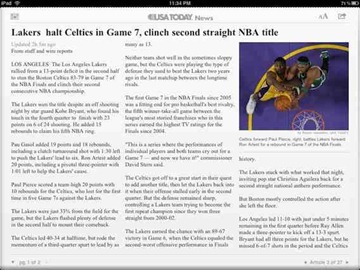 – Flip through the day’s best photos from news, sports, and celebrities in vivid, full-screen detail. Share your favorites with friends via email. 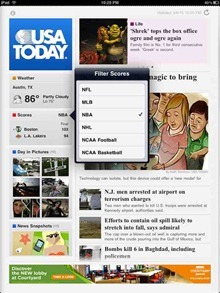 – Scan through USA TODAY Snapshots, and vote on a poll question for each. Review responses from all users and filter the results down to your current state and city. I’ve never been a fan of the print edition because I’ve always found it very light on content compared to more ‘serious’ papers. The iPad edition doesn’t change this major trait of USA Today, but the content it does have is presented so engagingly, and embraces what the iPad can do so well, that it is a much more compelling title in this form. It’s easy to tap on the large USA Today badge at the top left of the front page, to be presented with a popover where you can select among the paper’s four main sections – Front page, Money, Sports, and Life. You can customize what is displayed in the weather information panel near the top of the front page’s left pane, and it’s super easy and intuitive to do. You just tap on the weather panel itself and then tap the Edit Locations button and add, subtract, and alter the display order of locations just as you do in most iOS weather apps. If you have multiple locations set, you can swipe through them within the weather panel just as you would in a typical weather app. When you tap on the weather panel the popover that comes up shows more detailed information for whichever location was being shown, including a five day forecast. Like all popovers it only requires a single tap to bring it up and another single tap anywhere on the front page to dismiss it. Similarly, you can tap on the Scores panel (just below weather in the left pane of the front page) to see a popover with more scores detail or to choose which sport you’d like to see latest scores from. The choices are: NFL, MLB, NBA, NHL, NCAA Football, and NCAA Basketball. There are also ‘Day in Pictures’ panels for the main, Sports, and Life sections on the front page. You can browse these with a single tap on those panels – and the images are excellent. 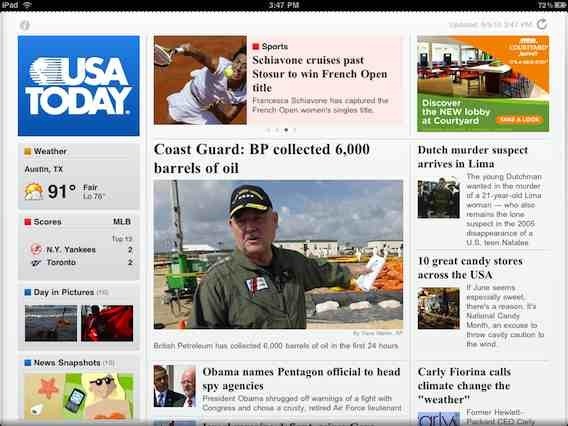 Another big strong point of USA Today for iPad is that it is continually updated, throughout the day and night. There’s a handy Refresh button at the top right corner of all pages, which is nice but you won’t even need to use it often. I’ve found I can open the app mid-evening and see a headline that says the XYZ game is close at halftime, and then check back in later and see a story covering the final result. Navigation within the app is simple and smooth. You can tap on the section badge at the top of the left pane to switch sections, and when you’re on an individual article page you can tap a Home button at top left to return to the front page of the section, swipe up/down to scroll through the pages of multi-page articles vertically and swipe left and right to move between articles. I like that on all individual article pages there is a footer strip that shows Page X of Y and Article X of Y within that section. It’s also easy to share content from within the app. Individual article offer a standard Share button at the top right, which let you share the item by email, Twitter, or Facebook. Everything is easy and intuitive in the app – it constantly ‘feels’ like an iPad app. 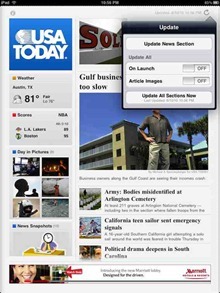 In my view it’s a great model of how to make a solid iPad edition for any newspaper. Its content may not be as extensive or in-depth as some other leading titles, but what it lacks in that sort of weight it makes up for in iPad friendliness. 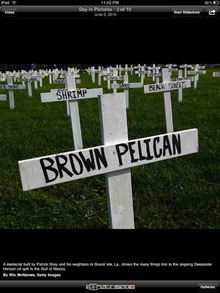 The app is currently free and ad-supported. This is due to change this month (July 2010) though when an initial sponsorship arrangement runs out and it moves to a subscription model. It will be fascinating to see whether USA Today can embrace this new digital medium with its pricing model as well as it has in the execution of the app itself. USA Today announced a couple of weeks ago that they would NOT start charging in July… they hedged on when but seemed to be considering keeping it free. Even though your disclosure says so, I hope you didn't pay anything for this app because it's free. No I didn't pay for the app – just inadvertently used the disclosure line when it wasn't needed. I've removed it now, thanks for pointing it out.